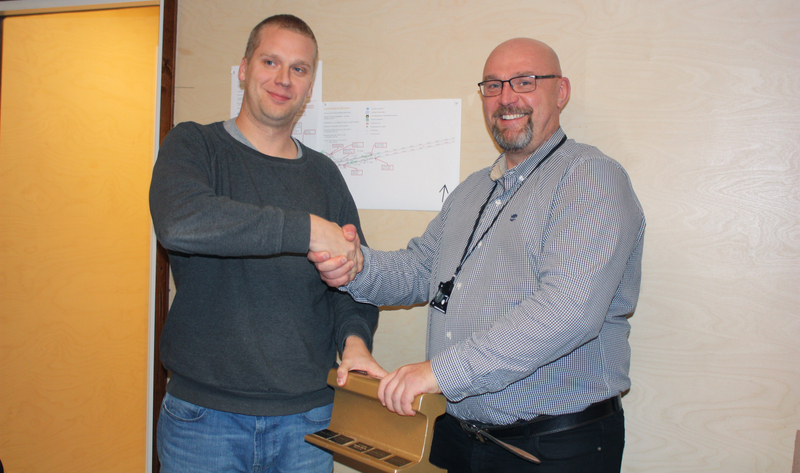 Lemminkäinen Infra Oy, the excavator contractor at Finnoo site, has been named the West Metro’s Safest worksite. The review period of the internal competition was from 1 January to 30 June 2017. The competition is organised semi-annually and its participants are all current West Metro worksites. The prize is a gilded piece of rail track, engraved with the name of the winning contractor. The award is granted on the basis of accident frequency monitoring and civil engineering worksite safety level (MVR) measurements. MVR measurements are carried out weekly on sites to measure different factors affecting safety, such as worksite cleanliness, condition of machinery and equipment, storage facilities, and protective equipment. The worksite with the best ranking scores in accident frequency monitoring and MVR measurements is named the winner. MVR results are given a weight of 80% in the ranking, while accident frequency monitoring carries a weight of 20%. “This worksite has always held the right attitude – safety requirements are complied with not just due to rules, but over a real concern for employees. Any flaws are addressed without delay,” says Tiia Virtanen, Safety Coordinator for the West Metro project. This is not the first time Lemminkäinen Infra Oy has won the award for safest worksite: the company is a two-time winner from West Metro excavation contracts and earned one award for the construction project of the Ruoholahti–Matinkylä section of the line. “It always feels good to get recognition such as this. It shows that we have been doing things the correct way. A culture of safety is important to us. It means that people can carry out their tasks safely and leave work healthy,” says Markku Okkonen, Site Manager for the Finnoo excavation project.